Earlier this month, Europe and much of the rest of the world paused briefly to observe the 100th anniversary of the day in 1918 when World War I, sill sometimes called the Great War, officially ended. In the United States, where we observe Veterans’ Day without explicit reference to World War I, this past November 11th constituted one of the rare occasions when the American public focused on the four-year conflict that took somewhere between 9 and 15 million lives, including approximately 116,000 Americans, and shaped indelibly the course of 20th century history. 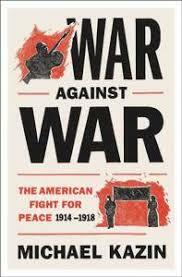 In War Against War: The American Fight for Peace, 1914-18, Michael Kazin offers a contrarian perspective on American participation in the conflict. Kazin, professor of history at Georgetown University and editor of the avowedly leftist periodical Dissent, recounts the history of the diverse groups and individuals in the United States who sought to keep their country out of the conflict when it broke out in 1914; and how those groups changed, evolved and reacted once the United States, under President Woodrow Wilson, went to war in April 1917. The opposition to World War I was, Kazin writes, the “largest, most diverse, and most sophisticated peace coalition to that point in U.S. history” (p.xi). It included pacifists, socialists, trade unionists, urban progressives, rural populists, segregationists, and crusaders for African-American rights. Women, battling at the same time for the right to vote, were among the movement’s strongest driving forces, and the movement enjoyed support from both Democrats and Republicans. Although the anti-war opposition had a decidedly anti-capitalist strain – many in the opposition saw the war as little more than an opportunity for large corporations to enrich themselves — a handful of well-known captains of American industry and finance supported the opposition, among them Andrew Carnegie, Solomon Guggenheim and Henry Ford. It was a diverse and colorful collection of individuals, acting upon what Kazin describes as a “profoundly conservative” (p.xviii) impulse to oppose the build up of America’s military-industrial complex and the concomitant rise of the surveillance state. Not until the Vietnam War did any war opposition movement approach the World War I peace coalition in size or influence. This eclectically diverse movement was in no sense isolationist, Kazin emphasizes. That pejorative term that had not yet come into popular usage. Convinced that the United States had an important role to play on the world stage beyond its own borders, the anti-war coalition sought to create a “new global order based on cooperative relationships between nation states and their gradual disarmament” (p.xiv). Its members hoped the United States would exert moral authority over the belligerents by staying above the fray and negotiating a peaceful end to the conflict. Kazin’s tells his story in large measure through admiring portraits of four key members of the anti-war coalition, each representing one of its major components: Morris Hillquit, a New York labor lawyer and a Jewish immigrant from Latvia, standard-bearer for the Socialist Party of America and left-wing trade unions; Crystal Eastman, a charismatic and eloquent New York feminist and labor activist, on behalf of women; and two legislative representatives, Congressman Claude Kitchen, a populist Democrat from North Carolina and an ardent segregationist; and Wisconsin Republican Senator Robert (“Fighting Bob”) LaFollette, Congress’ most visible progressive. The four disagreed on much, but they agreed that industrial corporations yielded too much power, and that the leaders of American industry and finance were “eager to use war and preparations for war to enhance their profits” (p.xiv). Other well-known members of the coalition featured in Kazin’s story include Jane Addams, renowned social activist and feminist; William Jennings Bryan, Secretary of State under President Wilson, three-time presidential candidate, and Christian fundamentalist; and Eugene Debs and Norman Thomas, successively perennial presidential candidates of the Socialist Party of America. Kazin spends less time on the coalition’s opponents – those who had few qualms about entering the European conflict and, short of that, supported “preparedness” (always used with quotation marks): the notion that the United States needed to build up its land and naval capabilities and increase the size of its military personnel in the event that they might be needed for the conflict. But those favoring intervention and “preparedness” found their voice in the outsized personality of former president Theodore Roosevelt, who mixed bellicose rhetoric with unadulterated animosity toward President Wilson, the man who had defeated him in a three-way race for the presidency in 1912. After the United States declared war in April 1917, the former Rough Rider, then fifty-eight years old, sought to assemble his own volunteer unit and depart for the trenches of Europe as soon as the unit could be organized and trained. To avoid this result, President Wilson was able to steer the Selective Service Act through Congress, establishing the national draft that Roosevelt had long favored – and Wilson had previously opposed. Kazin’s story necessarily turns around Wilson and his fraught relationship with the anti-war coalition. Stern, rigid, and frequently bewildering, Wilson was a firm opponent of United States involvement in the war when it broke out in 1914. In the initial months of the conflict, Wilson gave the anti-war activists reason to think they had a sympathetic ear in the White House. Wilson wanted the United States to stay neutral in the conflict so he could negotiate a lasting and just peace — an objective that the anti-war coalition fully endorsed. 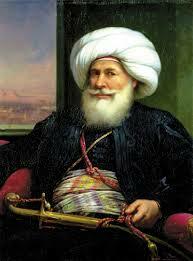 He met frequently with peace groups and took care to praise their motives. But throughout 1915, Wilson edged ever closer to the “preparedness” side. He left many on both sides confused about his intentions, probably deliberately so. In Kazin’s interpretation, Wilson ultimately decided that he could be a more effective negotiator for a lasting and just peace if the United States entered the war rather than remained neutral. As the United States transitioned to belligerent, Wilson transformed from sympathizer with the anti-war coalition to its suppressor-in-chief. His transformation constitutes the most dramatic thread in Kazin’s story. The issue of shipping on the high seas precipitated the crisis with Germany that led Wilson to call for the United States’ entry into the war. From the war’s outset, Britain had used its Royal Navy to prevent vessels from entering German ports, a clear violation of international law (prompting the quip that Britannia both “rules the waves and waives the rules” (p.25)). Germany, with a far smaller naval force, retaliated by using its submarines to sink merchant ships headed for enemy ports. The German sinking of the Cunard ocean liner RMS Lusitania off the coast of Ireland on May 7, 1915, killing more than 1,200 citizens, among them 128 Americans, constituted the beginning of the end for any real chance that the United States would remain neutral in the conflict. A discernible pro-intervention movement emerged in the aftermath of the sinking of the Lusitania, Kazin explains. The move for “preparedness” was no longer just the cry of the furiously partisan or a small group of noisy hawks like Roosevelt. A wide-ranging group suddenly supported intervention in Europe or, at a minimum, an army and navy equal to any of the belligerents. Peace activists who had been urging their neutral government to mediate a settlement in the war “now faced a struggle to keep their nation from joining the fray” (p.62). After the sinking of the Lusitania, throughout 1916 and into the early months of 1917, “social workers and feminists, left-wing unionists and Socialists, pacifists and non- pacifists, and a vocal contingent of senators and congressmen from both major parties,” led by LaFollette and Kitchin, “worked together to stall or reverse the drive for a larger and more aggressive military” (p.63), Kazin writes. The coalition benefited from the “eloquent assistance” of William Jennings Bryan, who had recently resigned as Secretary of State over Wilson’s refusal to criticize Britain’s embargo as well as Germany’s attacks on neutral vessels. In the aftermath of the sinking of the Lusitania, Wilson grappled with the issue of “how to maintain neutrality while allowing U.S. citizens to sail across the perilous Atlantic on British ships” (p.103). Unlike the peace activists, Wilson “tempered his internationalist convictions with a desire to advance the nation’s power and status . . . As the crisis with Germany intensified, the idealism of the head of state inevitably clashed with that of citizens whose desire that America be right always mattered far more than any wish that it be mighty” (p.149). As events seemed to propel the United States closer to war in late 1916 and early 1917, the anti-war activists found themselves increasingly on the defensive. They began to concentrate most of their energies on a single tactic: the demand for a popular referendum on whether the United States should go to war. Although the idea gathered genuine momentum, there was a flagrant lack of support in Congress. The activists never came up with a plausible argument why Congress should voluntarily give up or weaken its constitutional authority to declare war. In his campaign for re-election in 1916 against the Republican Party nominee, former Supreme Court Justice Charles Evans Hughes, Wilson ran as the “peace candidate,” dictated as much by necessity as desire. “Few peace activists were ambivalent about the choice before them that fall,” Kazin writes. “Whether as the lesser evil or a decent alterative, a second term seemed the only way to prevent Roosevelt . . . and [his] ilk from grabbing the reins of foreign policy” (p.124). By September 1916, when Wilson left the White House for the campaign trail, he enjoyed the support of the “most left-wing, class-conscious coalition ever to unite behind a sitting president” (p.125). Wilson eked out a narrow Electoral College victory in November over Hughes, with war opponents likely putting him over the top in three key states. Wilson’s re-election “liberated his mind and loosened his tongue” (p.141), as Kazin puts it. In January 1917, he delivered to the United States Senate what came to be known as his “peace without victory” speech, in which he offered his vision for a “cooperative peace” that would “win the approval of mankind,” enforced by an international League of Peace. 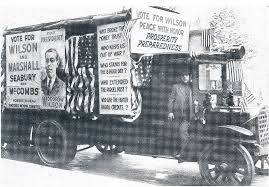 Borrowing from the anti-war coalition’s playbook, Wilson foreshadowed the famous 14 points that would became his basis for a peace settlement at the post-war 1919 Versailles Conference: no territorial gains, self-government and national self -determination for individual states, freedom of commerce on the seas, and a national military force for each state limited in size so as not to become an “instrument of aggression or of selfish violence” (p.141). Wilson told the Senators that he was merely offering an extension of the United States’ own Monroe Doctrine. But although he didn’t yet use the expression, Wilson was proposing nothing less than to make the world safe for democracy. As such, Kazin notes, he was demanding “an end to the empires that, among them, ruled close to half the people of the world” (p.141). Wilson’s “stunning act of oratory” (p.142) earned the full support of the anti-war activists at home and many of their counterparts in Europe. Most Republicans, by contrast, dismissed Wilson’s ideas as an “exercise in utopian thinking” (p.143). But, two months later, in March 1917, German U-boats sank three unarmed American vessels. This was the point of no return for Wilson, Kazin argues. The president, who had “staked the nation’s honor and prosperity on protecting the ‘freedom of the seas,’ now believed he had no choice but to go to war” (p.172). By this time, Wilson had concluded that a belligerent America could “end the conflict more quickly and, perhaps, spur ordinary Germans to topple their leaders, emulating their revolutionary counterparts in Russia. Democratic nations, old and new, could then agree to the just and ‘cooperative’ peace Wilson had called for back in January. 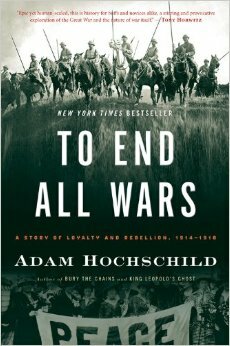 By helping to win the war, the United States would succeed where neutrality had failed” (p.172). 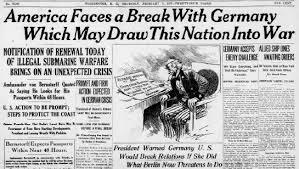 As the United States declared war on Germany in April 1917 (it never declared war on Germany’s allies Austria-Hungary and Turkey), it also seemed to have declared war on the anti-war coalition and anyone else who questioned the United States’ role in the conflict. The Wilson administration quickly turned much of the private sector into an appendage of the state, concentrating power to an unprecedented degree in the national government in Washington. It persecuted and prosecuted opponents of the war effort with a ferocity few in the anti-war movement could have anticipated. “In no previous war had there been so much repression, legal and otherwise” (p.188), Kazin writes. The Wilson administration, its allies in Congress and the judiciary all embraced the view that critics of the war had to “stay silent or suffer for their dissent” (p.189). Wilson gave a speech in June 1917 in which he all but equated opposition with treason. The next day, Wilson signed into law the Espionage Act of 1917, designed to prohibit interference with military operations or recruitment as well as any support of the enemies of the United States during wartime. The following year, Congress passed the even more draconian Sedition Act of 1918, which criminalized “disloyal, profane, scurrilous, or abusive language” about the government, the flag, or the “uniform of the armed forces” (p.246). The apparatus for repressing “disloyalty” had become “one tentacle of the newly potent Leviathan” (p.192). Kazin provides harrowing examples of the application of the Sedition Act. A recent immigrant from Germany received a ten-year sentence for cursing Theodore Roosevelt and cheering a Germany victory on the battlefield. Another served time for expressing his view that the conflict was a “rich man’s war and the United States is simply fighting for the money” (p.245); still another was prosecuted and jailed for charging that the United States Army was a “God damned legalized murder machine” (p.245). Socialist Party and labor leader Eugene Debs received a ten-year sentence for telling party members – at a union picnic, no less – that their voices had not been heard in the decision to declare war. The administration was unable to explain how repression of these relatively mild anti-war sentiments was helping to make the world safe for democracy. Many in the anti-war coalition, understandably, fell into line or fell silent, fearing that they would be punished for “refusing to change their minds” (p.xi). Most activists understood that, as long as the conflict continued, “resisting it would probably yield them more hardships than victories” (p.193). Those continuing in the shrunken anti-war movement felt compelled to “defend themselves constantly against charges of disloyalty or outright treason” (p.243). They fought to “reconcile their fear and disgust at the government’s repression with a hope that Wilson might still embrace a ‘peace without victory,’ even as masses of American troops made their way to France and into battle” (p.243). Representative Kitchin and Senator La Follette, the two men who had spearheaded opposition to the war in Congress, refrained from expressing doubts publicly about the war effort. Kitchin, chairman at the time of the House of Representatives’ powerful Ways and Means Committee, nonetheless structured a revenue bill to finance the war by placing the primary burden on corporations that had made “excess profits” (p.244) from military contracts. La Follette was forced to leave the Senate in early 1918 to care for his ill son, removing him from the storm that would have ensued had he continued to espouse his unwavering anti-war views. Female activist Crystal Eastman helped create the National Civil Liberties Bureau, a predecessor to the American Civil Liberties Union, and started a new radical journal, the Liberator, after the government prohibited a previous publication from using the mails. Socialist Morris Hilquit, like La Follette, was able to stay out of the line of fire in 1918 when he contracted tuberculosis and was forced out of New York City and into convalesce in the Adirondack Mountains, 300 miles to the north. Although the United States was formally at war with Germany for the last 19 months of a war that lasted over four years, given the time needed to raise and train battle ready troops it was a presence on the battlefield for only six months. The tardy arrival of Americans on the killing fields of Europe was, Kazin argues, “in part, an ironic tribute to the success of the peace coalition in the United States during the neutral years” (p.260-61). Hundreds of thousands of Americans would likely have been fighting in France by the summer of 1917 if Theodore Roosevelt and his colleagues and allies had won the fight over “preparedness” in 1915 and 1916. “But the working alliance between radical pacifists like Crystal Eastman and progressive foes of the military like La Follette severely limited what the advocates of a European-style force could achieve – before Woodrow Wilson shed his own ambivalence and resolved that Americans had to sacrifice to advance self-government abroad and preserve the nation’s honor” (p.260-61). Kazin’s energetic yet judicious work sheds valuable light on the diverse groups that steadfastly followed an alternate route for advancing self-government abroad – making the world safe for democracy — and preserving their nation’s honor. As American attention to the Great War recedes in the aftermath of this month’s November 11th remembrances, Kazin’s work remains a timely reminder of the divisiveness of the conflict.